The extraordinary forces experienced during rollover accidents call for high performance stiffening structures, especially within the A-pillar of convertibles. The next generation A-pillar inlay has been developed with Volkswagen Osnabrück using the ELiSE lightweight design process. During the design process, topology optimization results serve as a basis for the algorithmic structure generation. The design is subsequently adapted to the loads using parametric optimization techniques. 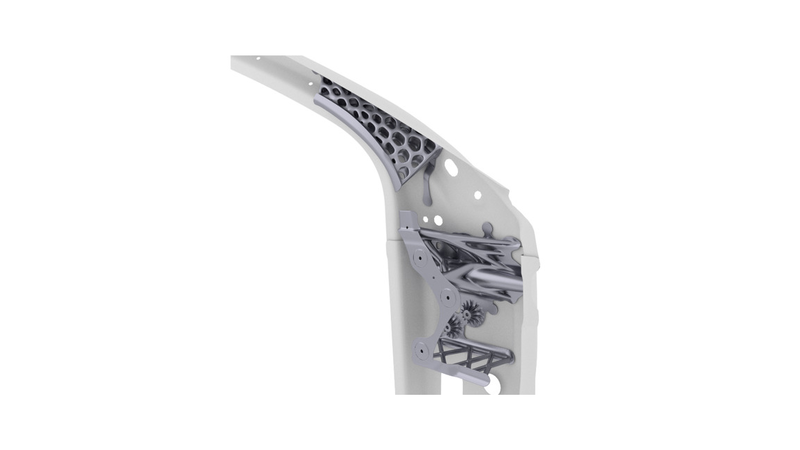 The use of additive manufacturing allows for complex structures featuring function and part integration, minimum weight, high mechanical strenght and therefore a maximum of safety and reliability. In cooperation with Volkswagen Osnabrück GmbH.